Both UpdraftPlus backup plugin versions are comprehensive in their features list. While you can schedule backups to run on regular intervals with both versions, there are differences between them. Both versions allow you to set separate schedules for full backups and database backups. Only the premium version allows you to select an exact day and time for those backups. With the free version, the day and time of the backup sets at the time you save the settings. In other words, if you save the auto backup settings at 11am on a Tuesday, the backups will always run according to the schedule you set in reference to that timestamp. So, if you set it to run daily, it will always be at 11am. If you set it to run weekly, it will always be at 11am on Tuesdays. That could be rather inconvenient, as that is usually a high traffic time and you don’t want to be loading your site with a backup run and slowing down site page load time. The trick with the free version is to save the settings in the middle of the night on a day when you are not likely to post, so it doesn’t interfere with your scheduled post publishing either. Or, you could purchase the Backup Time and Scheduling add on that allows you to set the schedule time. That’s especially important if you own a transactional site, such as a store or a member site and you need to backup your database more frequently. You can elect to leave the database out of the regular weekly file backups, and then backup the database by itself every day. With the ability to select the exact times and days, you are sure you won’t be running both backups at the same time, or during heavy traffic/purchase times. This feature is a big deal. If you ever need to restore your site from scratch, you’re going to wish you had those other files. If you use the free version, you need to manually download those files and upload them to your remote storage on a regular basis, or when you know they have been altered. That is most definitely a difference worth paying for. With the premium version, you can choose incremental backups which can save radically on hosting resources for larger sites. After the first full backup, you can set an interval for incremental backups which will only pick up what has changed since the last full backup. This will require restoring a few more files, but the host resource savings could be worth it. Because the backups are divided by folder type, both versions allow you restore whole folder types separately (plugins, uploads, themes, database). That’s very handy if you only want to restore something like your plugins after an update goes haywire. But what if you only want to restore one plugin? The premium version of UpdraftPlus allows you to restore individual files. That may not work for all plugins, especially ones that modify the database, but you can restore it separately too, in that case. This premium feature is definitely something worth paying for and will earn its keep in saved time the first time you need to use it. Both versions of the plugin natively support a wide variety of backup file storage options including AS3, Dropbox, Google Drive, Rackspace, and more. Updraft has its own storage option called UpdraftVault. Pricing starts at $70/yr for 1GB of storage. It supports 2 licenses (for storing files from 2 sites) and comes with 1 year of updates and support. With the premium version of the plugin, you get that level of storage on UpdraftVault for free. If you’re using the free version of UpdraftPlus, I highly recommend using Amazon S3 for storing your files. The first year is free and it’s pennies a month after that. And because AS3 is so inexpensive, perhaps getting the UpdraftVault storage is not worth paying for. READ: Setup Amazon S3 Account for Backup and Media Storage with a step-by-step video tutorial. Following are more features you can only get in the premium version. If you run a transactional site, such as an ecommerce store or membership site, and your database contains user info, you most definitely want to consider having database encryption as the file travels from your site to your remote storage. That journey is the most likely place it could suffer a man-in-the-middle attack, or be snooped on by a cyber Peeping Tom. That alone makes the premium version a no brainer for you. 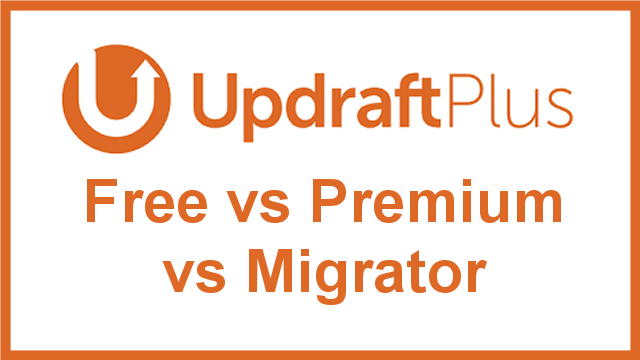 There is a bit of overlap in the migration/cloning function between the UpdraftPlus Premium version and the Migrator Add On, but there are also significant differences. The migrate/clone feature in the premium version is handy for creating a copy of your site in a staging area or other sandbox, so you can test or modify the site out of the public eye, and without disturbing your live, production site. The really big difference between the two plugins is that the premium version’s license is locked to its domain. Since the premium version comes with a 2 site license, that will cover both your production site and the staging/sandbox site with the migrated/cloned version. In other words, it’s great for personal use on your own sites. The Migrator add-on is a better choice for designers and webmasters, as it does not require you to license the plugin to each site you’re moving, or to the sandbox site where it is being moved/cloned. Keep in mind that the Migrator add-on is not actually an add-on. It’s a standalone plugin and does not require either the free or premium version of UpdraftPlus to be installed. In fact, if either is installed, it has to be deactivated prior to installing Migrator. Free Version – best suited for small to medium, lower traffic sites that change infrequently. Be sure to download your critical files that are outside of WordPress on a regular basis too (mentioned previously), else you’ll be sorry if you need to restore your site from scratch. A good rule of thumb is your site is on shared hosting, gets less than 5,000 hits a week, and changes once or twice a week. If you add the Backup Time and Scheduling add on, this is a good low-cost solution. Premium Version – best suited for medium to high traffic sites and an absolute must for transactional sites, such as e-commerce and member sites. It’s also likely that these sites suffer more financial loss due to down time. Being able to restore faster with individual files, and/or files outside of WordPress is a huge plus. The 1GB UpdraftVault storage option is a bonus as well, as is the ability to clone the site back and forth from a staging area or sandbox. Migrator Add On – best for designers and webmasters who regularly need to move client sites for revamps or for launching newly designed sites. The UpdraftPlus suite of plugins have become my top recommends and I’m proud to be associated with this vendor. I appreciate you using my affiliate links to purchase. That helps support all of the valuable, free info I publish on BlogAid. See my step-by-step tutorials for backing up your site and storing your files. UpdraftPlus Migrator Add On – 4 tutorials available in Level 2 of the Webmaster Training courses. “With the free version, the day and time of the backup sets at the time you save the settings. Let’s say I save the auto backup settings at 11am on a Tuesday, choosing weekly. What happens if a) doing a manual backup or b) changing the settings for automatic backups? Does it influence my “11am Tuesday” starting time? Hi Martin, to my knowledge, running a manual backup does not affect that timestamp on the auto backup schedule. That’s good news, thanks for fast response. There is a further issue regarding auto backup schedule. On https://updraftplus.com/faqs/my-scheduled-backups-do-nothing-backup-now-stops-midway/, nr. 6 it is said, that a password protection via htaccess deactivates the wordpress scheduler which is needed for automatic backups. Does this include EVERY KIND of PW-protection? My Admin-Login is protected by a second login, which is a very common and senseful security method: creating a htpasswd-file and some extra code in .htaccess… you certainly know this. Will this stop automatic backups? Or does the article talk about private sites, which are not accessible for unknown, public web users? Martin, that’s a level of troubleshooting I couldn’t get into without checking the site. And you would be better served with support from UpdraftPlus for it.